Today is the release of Spider-Man: Homecoming. Yes, yes, I can predict that you are all equally bored with the franchise as much as we were but, let me tell you, Homecoming is going to change all that. Thanks to the brilliant antics of one Mr. Tom Holland and director Tom Watts, we’re reunited with our loveable web-slinging hero who happens to do what a spider can. To celebrate the release of Spider-Man: Homecoming, we’re looking at the previous entries in the series and asking which one is the best? There’s a reason we’ve ranked this the worst film and that’s because it commits the most cardinal sin of cinema: It’s so desperately dull. It’s boring, horrendous, and benign. 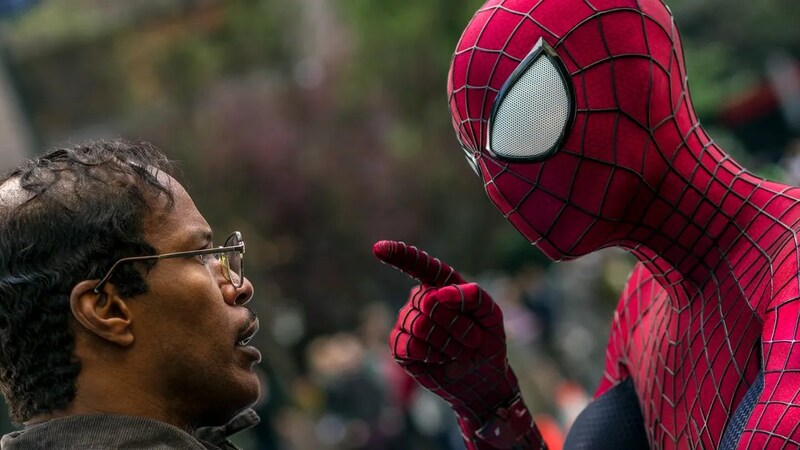 There isn’t an element here that works in an entertaining way: From Jamie Foxx’s pathetic wet blanket of a character to Dane DeHaan’s sickly villain, the sequel to the second origin story lacks appeal or interest. The only ounce of emotion uttered from this film is through Gwen Stacy’s death which, true, is emotionally performed but, ultimately, it is a singular superb moment coaxed in a bewildering tedious film that utterly wastes its characters and the actors involved. Please, look at the above, and tell me you abhor this film. While it couldn’t stand up next to the first cinematic outings of good ol’ Spidey, it is ridiculous and hilarious in how entertainingly bad the film is. And hey, remember a time where Tobey Maguire growing a fringe would be the “bad side” of Peter Parker and where Topher Grace was still a thing? It was filled with such pure innocence that populate horrifically awful films such as this. There’s some whopping action scenes, and tender emotional sequences (mainly from Thomas Haden Church’s Sandman,) but, ultimately, this is more re-watchable than ASM2 through sheer captivating awfulness. Writer Jo put it the best way: the Sam Raimi’s Spider-Man series is great but Tobey Maguire is somewhat iffy. However, Marc Webb’s The Amazing Spider-Man is iffy whilst Andrew Garfield is great. Despite bringing the most beloved anti-villain to our screens with Rhys Ifans as Dr. Curt Connors/The Lizard. The most perfect element within this series was the chemistry between Garfield’s Parker and one could say it was sad for Garfield and Stone to be wasted in such a manner but seeing as one has an Oscar and the other one a nomination, we’re sure they’ll be just fine. The first cinematic outing for Spider-Man still stands strong to this day. Though some may mock Maguire’s (I did say it was iffy) performance and it can seem dated 15 year’s on from now, he burst onto the screen with a vibrancy that is still engaging now. Sam Raimi gave us some iconic moments including the upside down kiss in the rain, the very first Uncle Ben shooting (the brilliant, late Cliff Robertson,) and Willem Dafoe’s manic Green Goblin character. Rushing through the New York skyline, Spider-Man swung with a high-octane beat that may make you scoff now with its undoubted corniness but still feels homely and wonderful. There’s also the superb soundtrack from Chad Kroeger’s Hero to Sum 41’s What We’re All About, as well as Danny Elfman’s engrossing score. There is a lot of contention in the ranks of Spider-Man fans since the release of Spider-Man: Homecoming but we’re certain that this is the most incredible adventure for the teen hero. Everyone’s Friendly Neighbourhood Wall-Crawler feels fresh and original with Tom Holland’s energetic performance. Whilst being able to balance emotion too, director John Watts brings Peter Parker back to his roots whilst still making it fun and rambunctious. With a great villain in Michael Keaton, jokes that land every time, and fan nods that will make you squeal, you’ll fall in love with the antics of Holland’s Spider-Man and wish to see it more. Spider-Man: Homecoming is out in cinemas now!